If you’ve popped over to my blog Including Cake then you may have some idea that I am a little obsessed with all things ‘oats’ and that includes granola…I could eat it all day long! I also love an opportunity for a little experimentation and have recently been playing around with buckwheat as a gluten free cereal alternative to oats since oats can cause sensitivities to some due to gluten cross contamination. Buckwheat groats are fairly large (by grain standards) triangular shaped ‘seeds’ that can be used in their whole form or commonly ground into flour. I often use buckwheat flour as my gluten free flour of choice for baking. Today I wanted to keep things simple and exploit the pretty little groats themselves, pairing them with a blended date past to bind them together. This experiment came off the back of our recent breakfast bar experiment where dates were used to sweeten with such successful results. This granola did not disappoint either! Here I made a date syrup with roughly a 4:1 ratio of dates to water (you can make a jars worth and store in the fridge for future use). Once again, we have a very versatile recipe as a great base for ‘mix ins’. I added cacao nibs and a little vanilla powder, but you could also add cocoa powder for a more intense chocolatey hit plus nuts, seeds or coconut if you fancy. Just be sure that the balance of dry to wet ingredients stays roughly the same to ensure the mixture clumps together well as it is baked. Mix the date syrup with the nut butter of choice, cinnamon and salt. Add the buckwheat groats and cacao nibs and mix through lightly until well coated. Lay in clumps in a even layer on a lined baking sheet and bake on a low temperature- approx 140C for approx 30-40 mins until just golden, a lower temperature ensure the dates don't burn. 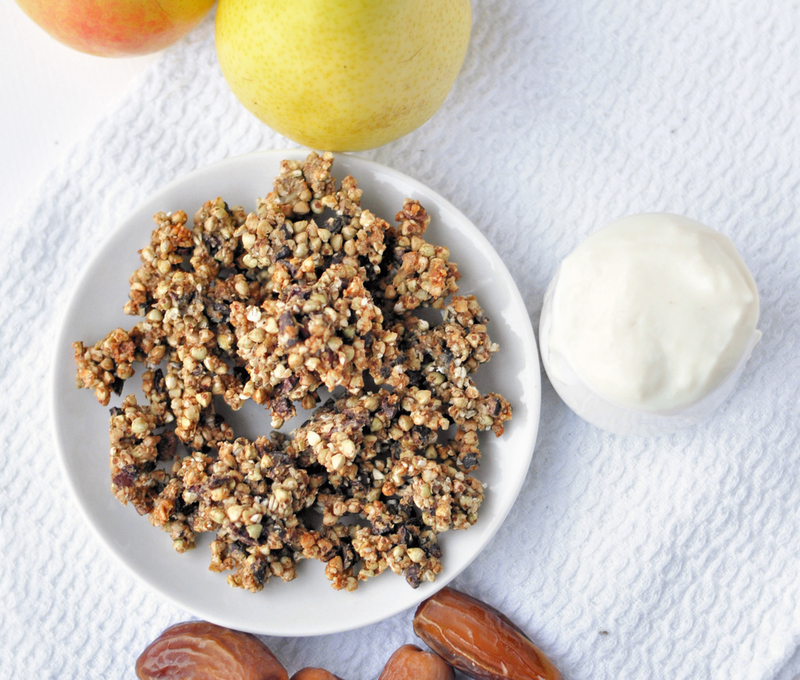 The granola will still be soft and sticky but will crisp up as it cools.